A formal Court of Inquiry is on even as all indications point to friendly fire — a common military occurrence worldwide. New Delhi: “S&*t happens” is what a top official said when a Mi-17 V5 chopper of the Indian Air Force (IAF) crashed in Jammu and Kashmir’s Budgam district, killing six service personnel and a civilian on ground. While a formal Court of Inquiry (CoI) is still on, all indications are that it could be a result of a friendly fire that took place in the “fog of war”, even though all possibilities are being looked into. 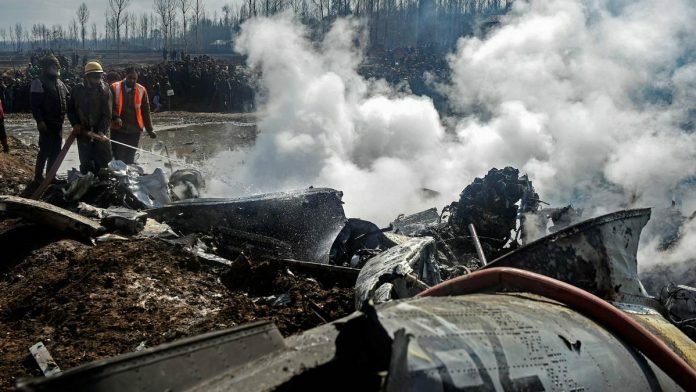 On 27 February, the helicopter crashed around the time IAF fighters were engaged in a dogfight with at least two dozen Pakistan Air Force planes along the Line of Control (LoC) in the Nowshera sector, around 100 km away from Budgam. Indian air defence systems were put on operational alert. The crash site was too far for even the outside possibility of a stray Beyond Visual Range Missile hitting it. There has been immense speculation from the day of the crash about the circumstances that led to it. The helicopter took off and crashed within the same 10-minute period when the air skirmish was on 100 km away, and the region’s airbases and military installations were on high-trigger alert. Sources say that a Spyder short range surface-to-air missile was fired and there are witnesses to it. The CoI is looking into the circumstances that led to the helicopter crash with top defence sources maintaining that the force will not shy away from fixing responsibility and taking action. The CoI is also ascertaining whether or not the Identify, Friend or Foe (IFF) system in the helicopter was switched on. A number of interviews with service personnel and video recordings are being used to identify the cause and lapses that led to the incident. Even if the CoI does conclude this was a case of friendly fire, this would not be the first time this has happened. Friendly fire, in fact, is the military’s bane across the world. On 29 April 1987, Wing Commander Amjad Javed of Pakistan Air Force had shot down his own wingman, Flight Lieutenant Shahid, mistaking him for an enemy. Right from the Battle of Barnet in 1471 to the Afghanistan war, almost all countries that have gone to war have been impacted by it. In 2014, five American soldiers were killed in a US air strike in Afghanistan. Friendly fire has been described as “an element of war that is older than the nation”. In Afghanistan, many American and Afghan soldiers have been killed in such incidents. During the Iraq war, US troops killed at least seven and wounded 34 of their compatriots in 18 suspected friendly fire incidents. An earlier version of the report referred to the Identify, Friend or Foe (IFF) system as the ‘Identify, Friend of Foe (IFF) system’. The error has been corrected. You didn’t win in 48,65, nor 99. Stop lying you hindians. I’ll give you 71 which was a defeat for Pakistan. Your military can’t fight nor it has the will to fight. Rasing doubts over IAF’s capability after our armed forces won 48,65,71 and Kargil wars decisively is a shame. IAF’s capability has been recognised even by US Air Force in joint exercises with IAF. What are the credentials of this writer or credibility of his so called authentic sources ? The report is not yet out but this fellow, along with Print, is constructing a narrative , definitely with a malafide intention and biased intellectualism. Fit for its rightful place, that is the garbage dustbin, under your table !! Looking at back to back articles directed towards showing Indian defence and IAF in poor light. Also, revealing too much information in public domain from the so called “sources”, very clearly The Print seems to have an agenda. Also, the team at Print seem to have concluded that Balakot has failed and swears by whatever the oppn parties are claiming. Busted! Looks like our air Force is a joke. The whole international media is laughing at us. There were no causalities in Balakot strike but we did manage to kill our own people. Shame on Indian air Force. They are only capable of hitting Pakistani balloons. And the claim that they have shot down an F-16 is too far fetched. Cannot even give proof. The Pakis on the other hand have given proof of all their claims. Shame on Indian Air Force. There is no objective reason for the opposition to feel diffident, raising issues pertaining to national security, provided it is done in a mature, responsible, nuanced manner. The Governor spoke of “ lapses “ that led to the high loss of life at Pulwama. A month and a half later, whether a detailed enquiry has been conducted, responsibility fixed. Downing of an IAF helicopter, with six personnel on board, by friendly fire is something grave enough to result in court martial proceedings. Figures of rising casualties – across all categories – in Kashmir, accompanied by a spurt in the number of young men turning to militancy cannot be seen as a metric of success of either policy or operations. The short point is that the opposition needs to engage on all these issues, doing its homework, the way Ms Nirmala Sitharaman used to. 2. Another related issue is foreign policy. There is life beyond Pakistan. Start with South Asia and the comatose state of SAARC, the natural vehicle to project Indian preeminence in the neighbourhood. Or consider the state of the relationships with China and the United States. This shows that when we declare war on enemy, our own people may lose their lives as consequence.